The next participating artist of the first phase of the DUBAI STREET MUSEUM we present to you is MARTIN WHATSON from Norway. His current work „Palm Tree“ joins the amazing series of murals from international street artists that were painted in the famous 2nd of December Street in Al Satwa within the last days. Next to artworks of 1010, CASE, JULIA VOLCHKOVA, HUA TUNAN, SETH THE GLOBEPAINTER and ERNEST ZACHAREVIC the new large-scale painting of MARTIN WHATSON pushes the limits of this unique contemporary street art event in the Middle East. MARTIN WHATSON, born 1984, is a Norwegian street artist who studied graphic design at Westerdals School of Communication in Oslo. His work is based on stencils and he started his own stencil production in 2004. His paintings often show figures, animals and humans, who are acting with their surrounding or are in a direct movement. WHATSON choses mostly grey walls for his paintings and interacts with city landscapes and old abandoned buildings. As a contrast to this achromatic mood he uses all kind of different colors of MONTANA-CANS to fill his figures with a gestural multicolor pattern. His work has a positive impact on the city environment, especially in Dubai. 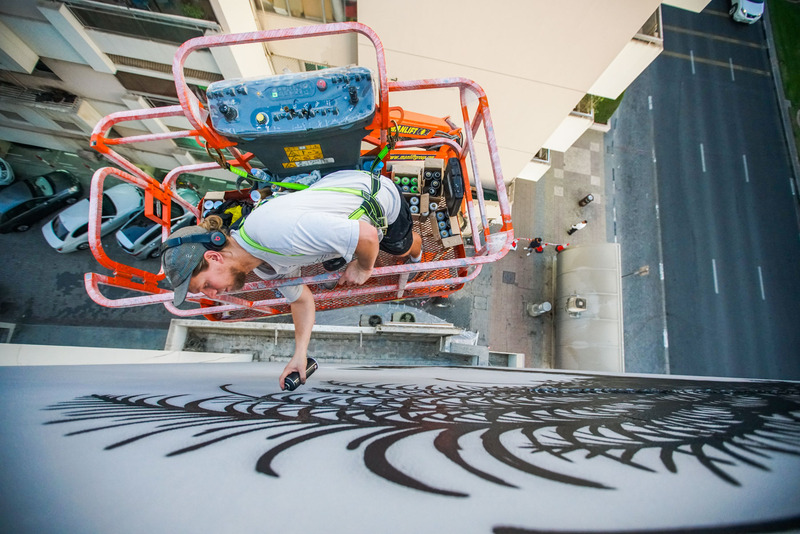 The DUBAI STREET MUSEUM grows continuously and becomes one of the most interesting open-air exhibitions for street art worldwide. If you are in Dubai, take a walk through 2nd of December Street to see this impressive artworks of MARTIN WHATSON and so many others live in the streets.